Treasury Secretary Jack Loo has announced a woman’s face will appear on U.S. paper currency in 2020 to commemorate the centennial of women’s suffrage. Now begins the debate about which woman should be on the money, and which man’s face should disappear. Millions of U.S. spenders have already nominated their favorite great woman. Leading candidates include Susan B. Anthony, Rosa Parks, Sojourner Truth, Sacagawea, and Harriet Tubman. Any one of these women would enhance the righteousness if not the intrinsic value of U.S. lucre. My own candidate to honor the money has long been Eleanor Roosevelt, one of the great figures of the 20th century, a defender of the poor and a tireless proponent of human and civil rights. When I was a teenager, I wrote to Mrs. R several times and she always wrote back. She was her own typist, using an L.C. Smith Super Speed typewriter now on display at the Roosevelt Library in Hyde Park, N.Y., and her letters were always exemplars of concise warmth. In 1962, I typed out my own list of seven questions and sent them to her as an interview-by-mail for my high school paper. Again, she replied with conscientious precision. I’d be happy, of course, if the Treasury named any of the women named above because they all played an indispensable role in U.S. history. 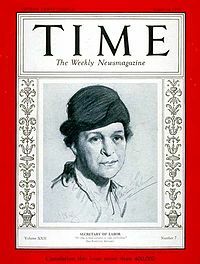 If I could nominate another name, it would be Frances Perkins, the first woman to hold a cabinet post (under FDR and Truman) and an unflagging advocate of the U.S. Labor movement. 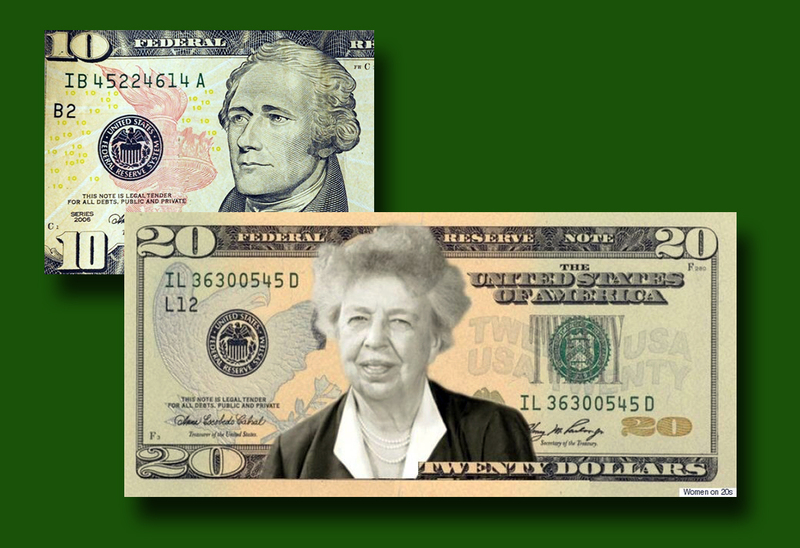 But Secretary Loo has proposed that a woman replace Alexander Hamilton on the $10 bill. That’s the wrong way to implement a great idea. Hamilton is one of the indisputably great founders of the United States. He was the nation’s first Treasury Secretary and, according to his biographer Ron Chernow, set in place “the building blocks of a powerful state: public credit, an efficient tax system, a customs service, and … a strong central bank.” He was also – virtually alone among the founders – a lifelong opponent of slavery. Many historians believe that Hamilton was singularly responsible for the success of President Washington’s administration, and some rank him above Jefferson and Madison in the pantheon of founders. He is not, however, a vivid figure in the U.S. collective memory, so it may have been easy for Loo to pass him over. Hamilton’s prestige may grow now that Broadway virtuoso Lin-Manuel Miranda’s Hamilton has become the Great White Way’s second most successful musical (behind The Lion King). Clearly A. Ham. (as he signed his name) has the stuff of legendary lore, and our progeny may come to think of him as a folk hero. Whether that happens or not, he is a far more preferable male candidate to stay on the money than Andrew Jackson, who currently adorns the $20 bill. Jackson was a charismatic populist and undeniably colorful. He was even a bit of a childhood hero to Boomers who remember “Old Hickory” in The Adventures of Davy Crockett, and Charleton Heston’s spot-on portrayal in The Buccaneer. Even before he won the Battle of New Orleans, Jackson earned a reputation as a brutal and sometimes sadistic Indian fighter. Among native peoples, Jackson is the evil author of the Trail of Tears and the genocidal remover of native peoples from their tribal lands. Jackson also stubbornly opposed abolitionist efforts to eliminate or curtail slavery in the U.S. If ever there was a likely candidate to be fired from the money, it’s Andy Jackson. Alexander Hamilton: keep him on the ten in honor of his immeasurable contributions to our country. Andrew Jackson: take him off the twenty so his racist, xenophobic image will fade from our view. Eleanor Roosevelt: put her on the twenty where her countenance may remind us of all that is right and decent about our native land.